Posted in: Well Read. Tagged: Apparel, Ballet, Dance, Education, Engineering, Materials Science, Mechanical Engineering, Research, Technology, Textiles, Well Read. Now more than ever, kids are being introduced to the possibilities of a career in engineering and the sciences. There are commercials encouraging young scholars to study engineering and plenty of programs to help underrepresented demographics obtain a scientific/technical degree. Even other fields of study such as business and apparel merchandising management (AMM) are offering classes to become better versed in solving technical problems. A few weeks back, I stumbled upon an article written by Carly Owens about a fellow CPP Bronco named Esthella Gonzalez. Esthella is a recent AMM graduate who took a more technical approach to her senior project. She was tasked with tackling a sports related apparel problem commonly found in ballet. Pointe shoes, the one’s used by ballerinas for dancing on the tips of their toes, have very high wear rates. Ballerina shoes typically wear out after about 20 hours of normal use and can be completely worn down even after one performance. This has caused a major need for better materials and performers have been calling out for someone to help with this problem for years. Esthella started out her research by running 14 materials through common textile tests also used in the engineering field: tear strength, seam strength, and abrasion resistance. Similar tests also are used to determine mechanical properties of materials and for the classification of materials commonly used in engineering practice. 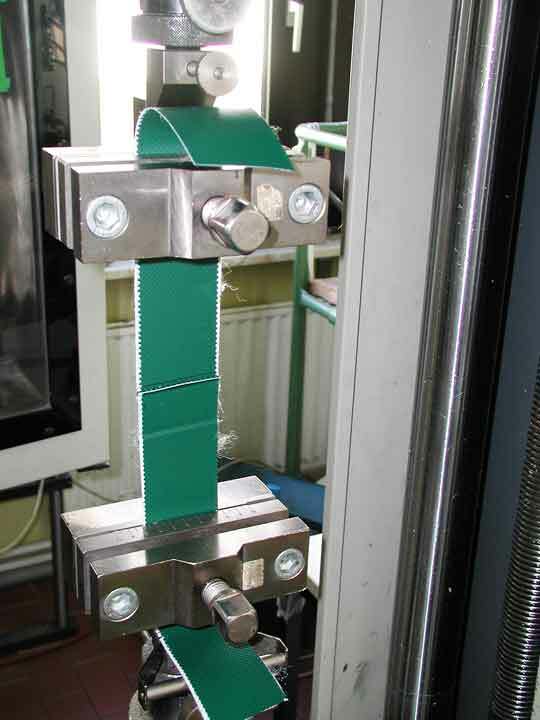 Seam Strength Test. Photo Credit: 4U2SEA. Esthella at first dreaded her given task but, through hard work, has achieved great success in here findings. She found that a material called Gabardine, composed of mostly polyester, performed the best overall in all three tests. It outperforms the traditionally used Satin which can run into the thousands to repair. This cost is also compounded by the fact that ballerina shoes are all custom made. After finding success in her two-quarter long project, she was encouraged to continue research and even submitted an article to the academic journal Fibers and Polymers. Introducing students to the world of science at an early age and encouraging those interested in it to continue their study is only a good thing. Aside from advancements in consumable technology we can expect to see advancements in fields not commonly tied to engineering. The medical field and agricultural economy for example always benefit from new breakthroughs in science and cutting edge equipment. Esthella’s unexpected blend of science, engineering, and apparel is just the tip of the iceberg! To support the completion of our project, please check out our GoFundMe site and pass it along to your friends. We are nearing our first milestone of $1,000 and need your help! Thanks everyone! ← 10 Greatest Feats In Engineering for 2014!